When someone wants to tell you a story about a recent customer experience, it usually tends to be more Tales from the Crypt than Happily Ever After. But that’s not to say good service isn’t out there. Here are 11 companies that will restore your faith – at least temporarily. Author and business consultant Peter Shankman was getting ready to board a flight that was the last leg of a long day of traveling. It just happened to occur over dinnertime, and he knew he would be starving when he deplaned and headed home. “Hey, @Mortons – can you meet me at newark airport with a porterhouse when I land in two hours? K, thanks. :)” Imagine his surprise when he got off the plane to find a tuxedoed gentleman holding a bag that contained a 24 oz. Morton’s porterhouse, shrimp, potatoes, bread, napkins and silverware. Shankman noted that the Tweet had to be noticed, someone had to get approval for the idea, a cook had to make his food, the food had to be driven 23.5 miles away from the nearest Morton’s, and someone had to track down his flight information and figure out where he was landing to meet him at the right location. All while his stomach was grumbling on a 2.5-hour flight. Pretty impressive. Sainsbury’s, a grocery store in the U.K., must have been pretty amused when they received a letter from a three-year-old girl named Lily. “Why is tiger bread called tiger bread?” she asked, referring to one of their bakery items. “It should be called giraffe bread.” Lily was just being observant – the pattern on the bread does resemble a giraffe more than a tiger. To everyone’s surprise, Chris King, a customer service manager at the chain, responded. “I think renaming tiger bread giraffe bread is a brilliant idea – it looks much more like the blotches on a giraffe than the stripes on a tiger, doesn’t it? It is called tiger bread because the first baker who made it a looong time ago thought it looked stripey like a tiger. Maybe they were a bit silly.” He enclosed a gift card, and the bread was renamed. I could do an entire story on Zappos customer service superstars alone, but I’ve limited it to one of my favorites instead. A customer’s mother had recently had some medical treatment that left her feet numb and sensitive to pressure – and also rendering most of her shoes totally useless. She ordered her mother six pairs of shoes from Zappos, hoping that at least one of them would work. After receiving the shoes, her mother called Zappos to get instructions on how to return the shoes that didn’t work, explaining why she was returning so many shoes. Two days later, she received a large bouquet of flowers from Zappos, wishing her well and hoping that she recovered from her treatments soon. Two days later, the customer, her mother and her sister were all upgraded to “Zappos VIP Members,” which gives them all free expedited shipping on all orders. Not impressed? Just Google “Zappos” and “customer service” and you’re bound to find something that astounds you. A Redditor’s 89-year-old grandfather got snowed in a couple years ago and didn’t have much in the house for meals. His daughter called several markets in the area to see if any of them had grocery delivery services, but the only one that said they did was Trader Joe’s. They don’t, actually, but were willing to help out this WWII vet. 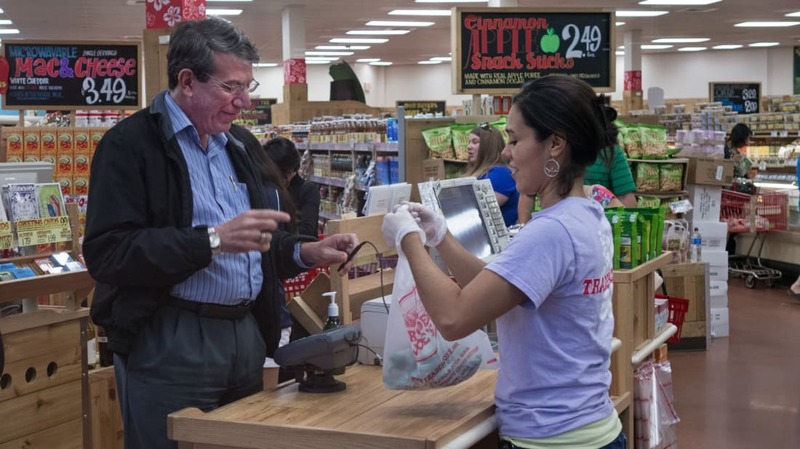 As the man’s daughter placed an order, the Trader Joe’s representative on the phone recommended other items that would be good for her dad’s low-sodium diet. An up-sell, you may be asking? Nope. They didn’t charge her a dime for the delivery or the groceries. If you order a PlayStation online and it gets snatched from your doorstep instead of being delivered safely to your living room, that’s your problem, right? Or maybe it’s the delivery service’s problem. Or it’s the problem of the neighbor who signed for your expensive gaming system but didn’t bother to bring it inside to protect it from sticky fingers. Wherever the blame lands, it’s definitely not the problem of the company who fulfilled their end of the bargain by shipping the system using a secure method. However, when this scenario happened to an Amazon customer a few years ago, he called them to beg – plead – to see if there was anything that could be done because his son was expecting a PlayStation from Santa. Much to the customer’s shock, they not only sent another, but they didn’t even charge him for shipping. It even made it there on time for Christmas. Because of their son’s food allergies, a family vacationing at the Ritz-Carlton, Bali, was always careful to bring their own supply of specialized eggs and milk. In this particular instance, however, the food was ruined en route. The Ritz-Carlton manager couldn’t find any of the special items in town, but his executive chef recalled that a store in Singapore sold them. The chef contacted his mother-in-law, who lived there, and had her purchase the items, then fly to Bali (about 2.5 hours) to deliver them. Only at the Ritz-Carlton. The tales of Nordie’s customer service are so mind-boggling that some of them are considered urban legend, but I’ll give you one that’s definitely factual. In 2011 a member of the security staff noticed a woman crawling around on her hands and knees on the sales floor. When he discovered that she was looking for a diamond that had fallen out of her wedding ring while she was trying on clothes, he got down and searched with her. He also recruited a small team of people to help comb the floors. Eventually, the crew painstakingly picked through the dirt and debris in the store vacuum cleaners before coming up with the woman’s diamond. Most of us have experienced it at one time or another – the dreaded vehicle recall. It’s usually some minor part, but replacing it ends up being a huge inconvenience for the car owner, even when replacement parts are free. Lexus certainly knows how to take the sting out of that. Although previous recalls had been addressed by sending technicians to the affected customers’ homes to fix the problem on the spot, when the Lexus ES 350 sedan was recalled in 2006, the company decided to ask owners to come on into the dealership. Instead of sitting in a waiting room waiting for their cars to be worked on, customers were given a brand new Lexus instead, no questions asked. Let’s spread a little goodwill today – tell us your best-ever customer service story in the comments.